With Christmas just around the corner (and my gift shopping not quite done), I was looking around for fun, unique Christmas gifts for people who have careers and can afford to buy things on their own. 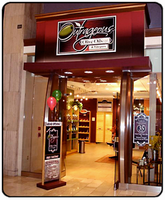 I stumbled across Outrageous Olive Oils in Scottsdale, AZ, in my monthly Yelp newsletter. My reaction: Olive oil? Yummy and healthy and usable! Olive oils with unique flavors? Even more appealing!